En Croute is a food that has been wrapped in pastry dough and then baked in the oven. Traditionally, the type of pastry used for making Pâté en Croute is a simple straight pastry dough called pâte à pâté, or pâté pastry. But today, puff pastry is frequently used for most en croute recipes. Our lovely Monkey Queen of Don’t Make Me Call My Flying Monkeys, was our May Daring Cooks’ hostess and she challenged us to dive into the world of en Croute! We were encouraged to make Beef Wellington, Stuffed Mushroom en Croute and to bring our kids into the challenge by encouraging them to create their own en Croute recipes! We were allowed to use our favorite foods and experiment with the types of bread/pastries to wrap up the food of choice. Food wrapped in pastry or bread is very popular in the middle east. I have already shared my spinach pastry triangles and my cheese pastry “fatayer jebneh” but since this was a daring cooks challenge,I had plans to do something with chickens and mushrooms or fish but as usual time was not on my side this month and I ended up taking the easy (but still yummy) way out. I decided to use up some of my homemade string cheese for my food of choice. I love how this cheese melts perfectly when heated. Add a little parsley for refreshment and flavor and you have one of my favorite cheese/herb combos. So why not wrap it with some buttery puff pastry? I wish I had some homemade puff pastry as I am sure it would have taken these cheese turn overs into the next level but I was out and since we agreed we were going to take the easy way, store bought puff pastry did the job. 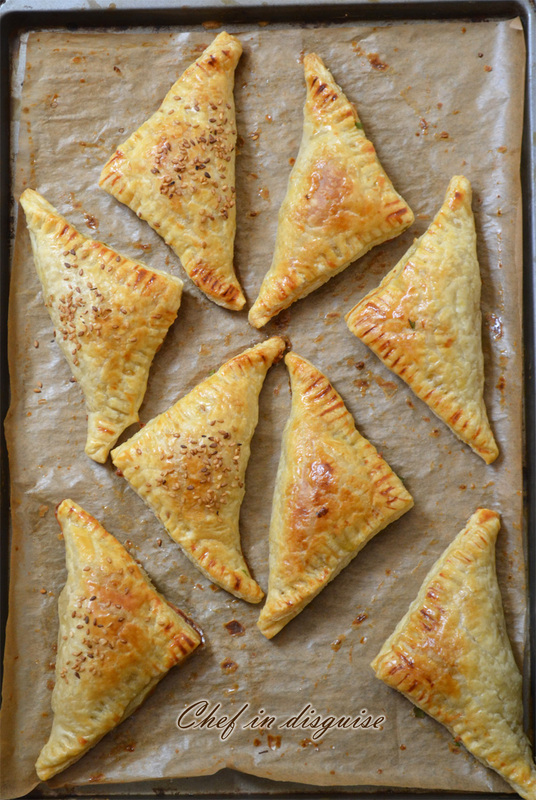 These buttery, golden and slightly crunchy triangles go by many names.Cheese turn overs, easy samosa or cheese en croute. No matter what you decide to call them, they are quick and easy to prepare making them a great option when you have guests coming on short notice. Paired with a cup of tea and a little salad they make for a wonderful meal, one that does not require you to spend half the day in the kitchen. What I like the most about recipes like this one is that they are easy enough for kids to help with, I had fun making these with my 4 year old son, he did the egg wash and helped with sealing the triangles with a fork. Beat the egg with the vinegar, this will be your egg wash.
Brush each turnover with egg wash. Put each turnover onto a baking sheet lined with parchment and bake for 15- 20 minutes at 425F/220C/Gas mark 6 or until the turniovers are golden brown. Serve warm, (the filling inside may be a bit hot). Posted in Appetizer, Breakfast, Daring cooks and tagged breakfast, cheese en croute, daring cooks, pâté en croute, puff pastry, quick and easy entertaining ideas, Samboosek, samosa with puff pastry, samossa filling ideas. Bookmark the permalink. 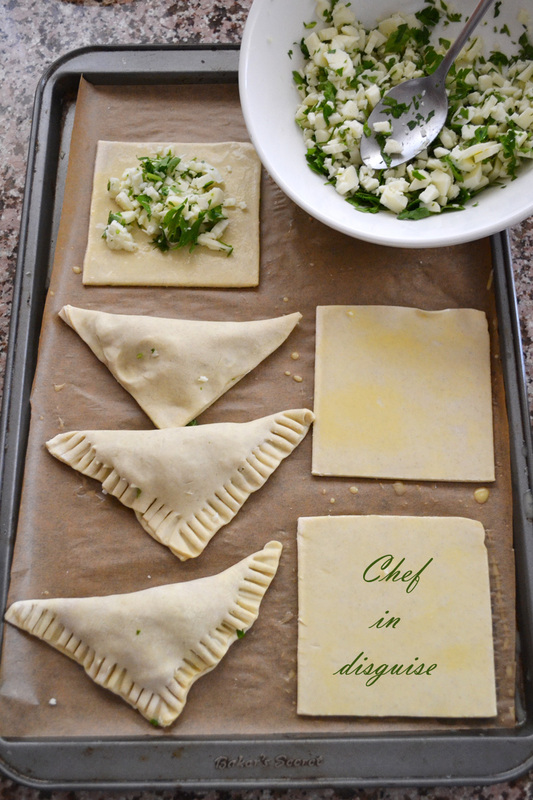 Sawsan I am drooling here and I wish I could have your gorgeous perfect cheese and herb turnovers now. Need to check out your homemade string cheese, I must have missed it in the past. Thanks for sharing! They look very tempting indeed, it was the little finishing touch of a sprinkle of seeds that really caught me eye, a true finishing touch! I can almost taste the buttery pastry against the slightly salty cheese and fresh green punch of the parsley. It’s difficult to see how big/small they are but from the one tbsp of filling they might be hors d’œuvres size, perfect for cocktail parties. We’re back to fall weather here so I actually wouldn’t mind turning the oven on. I’ll have get puff pastry squares on my list for the weekend. Simple perfection! I love the photos and your turnovers look like I could eat them all. Thank you so much for participating in this months challenge. Yum, these look so good! And your photographs are gorgeous! These look great! I’ve made these before, but it’s been years. It’s always fun playing with puff pastry, isn’t it? Love the pictures. Good stuff – thanks so much. as usual, you made your assignment shine! Puff pastry triangles are my fav snacks. And these look perfectly turned out. Totally yumm!!! Food wrapping is such an awesome choice! Wow!! You had me at home-made cheese! Lovely! There is no better improvement to perfect cheese than a cozy pastry blanket! Those look so yummy, and much easier to fix than the Wellingtons. I like that your son helped – did he sprinkle the sesame seeds onto some? 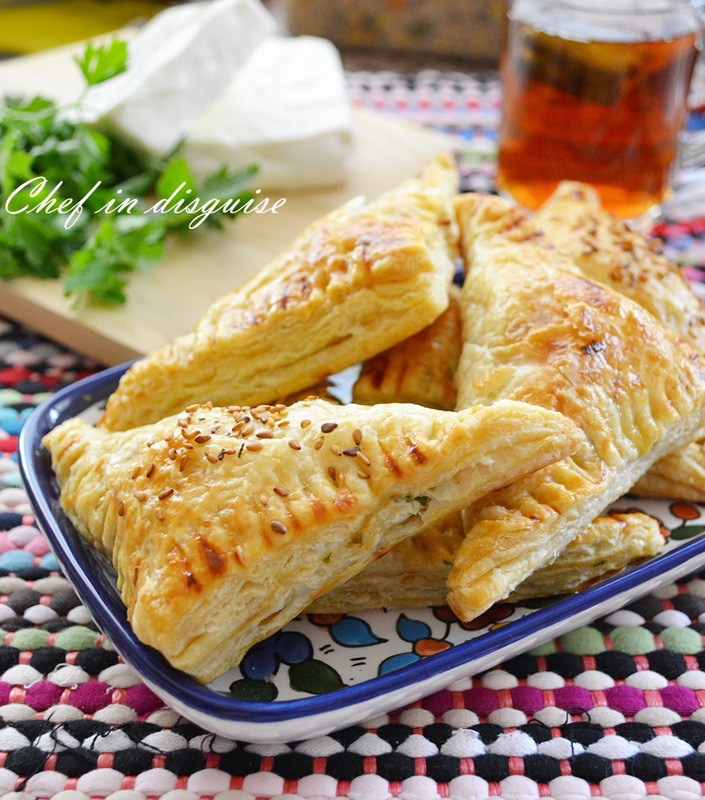 the combination of herbs and cheese is amazing; add in puff pastry and I bet it is to-die-for! Delicious looking puff pastry and I would SO have used the same cheese, spinach or mushroom filling from my own fatayer experiment. 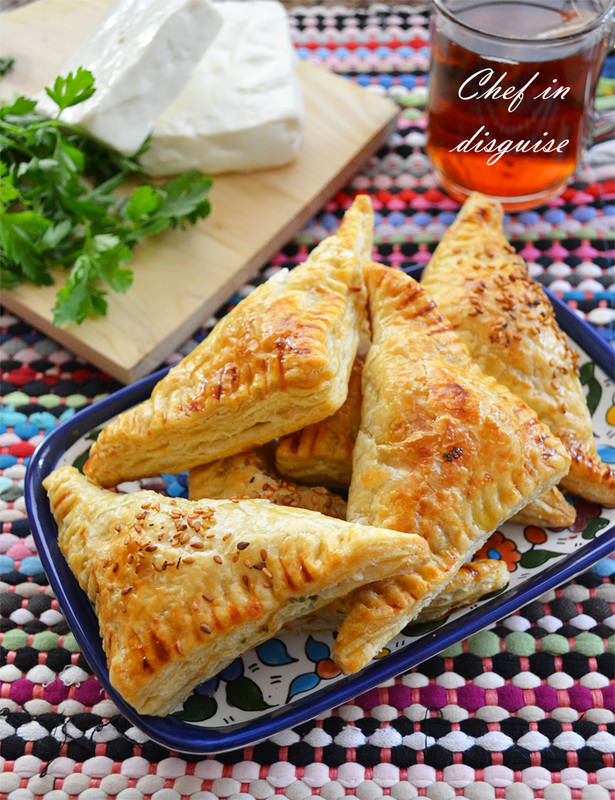 I’ve been wanting to make chicken curry puffs for a while now too which is another great filling idea to try, I think. I’m curious what you used to sprinkle over the top after the egg wash that had sesame seeds in it. Was it zataar? Love any kind of puff pastry filled with goodies! These look delicious! My goodness, those little triangles would have me standing in line for seconds. 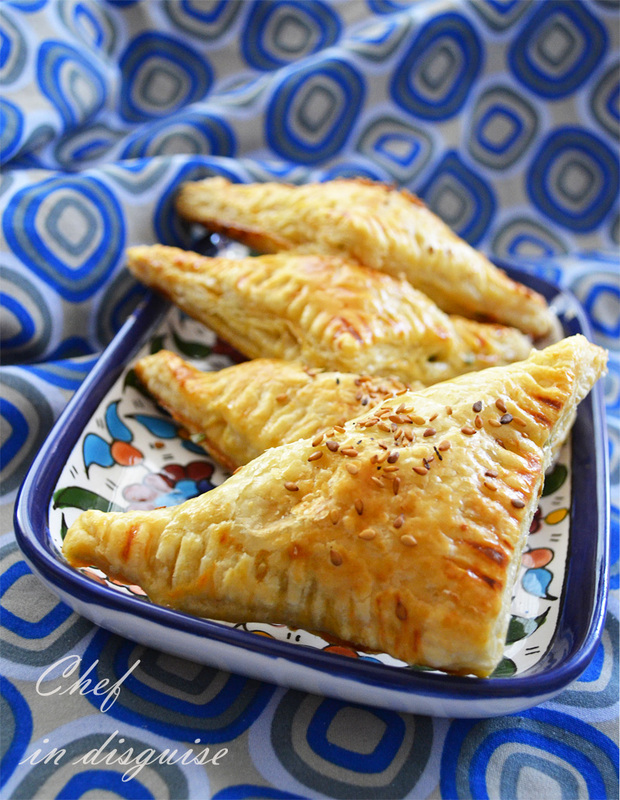 Your cheese turnovers look delicious and flaky. Oh yummy! Your turnovers look amazing! I love the melty cheese inside! I could definitely eat a bunch of these!! I love your photos!! Great job. I love how versatile puff pastry can be. These turnovers look delicious, Sawsan. Puff pastry with homemade cheese- you are such an original chef. I am just now embarking on my challenge- always the late one. Your pictures are beautiful as usual. Spendid job on this en croute task, Sawsan! 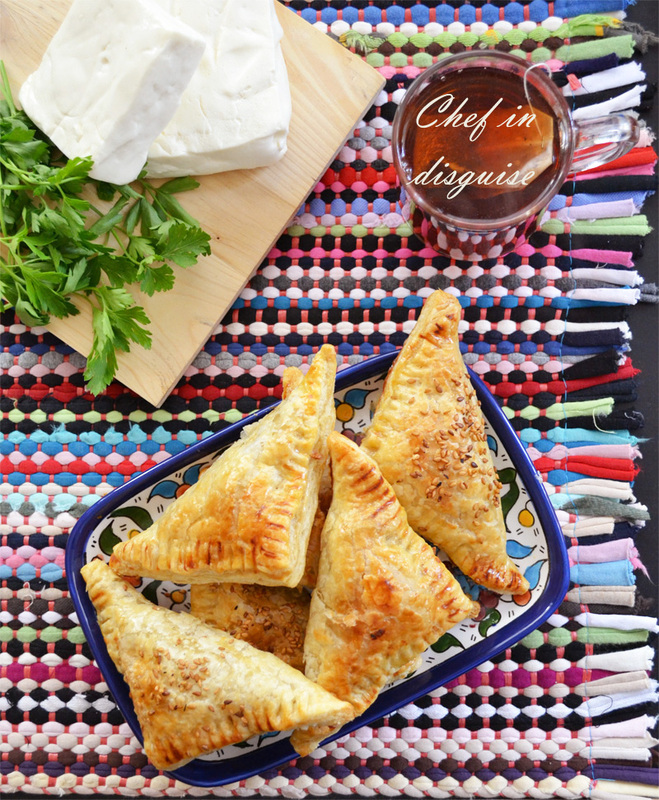 These sorts of cheese-filled pastry treats are my favorites Sawsan…and you…and your four-year-old have shown how easy it can be to put something so delectable on the table! Bravo! These look absolutely wonderful! Fabulous turnovers! They look so light and I love the filling you chose! Hi Sawsan, pastry makes everything delicious, doesn’t it? These look so pretty, and expertly done. I’d skip the paneer I think, after my last “experience” with it in my bread rolls. Feta or halloumi would be fantastic inside though – good call! Salam Dear Sawsan, your blog is so great. I love this recipe sometimes I want to make something quick and this is just great. Thank you and I was searching for Kunafa or Kanafa but I did not see it on your blog :). Keep up the good work and wish you all the best.